Greg Cohen making a big play for the Revolver D line in the Semifinal game at the 2014 US Open. Most folk who wander this earth will get dealt a tough hand now and again. How we react to these difficult life events often defines who we are. Such is the case for Greg Cohen, who, at the tender age of 23, already has an AUDL title with the San Jose Spiders and a WUCC gold medal with Revolver under his belt. Anyone who knows Greg will tell you that the only thing bigger than his shoulders is his smile. True to his nature, Greg’s road to owning the skies of San Francisco is a compelling story. Since being diagnosed, Greg has had to monitor his blood glucose closely, take about five daily insulin shots, and carefully watch his food intake. During sporting activities his blood sugar can decrease, so he counteracts this with glucose. 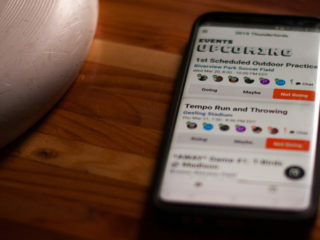 Managing ultimate can often be a difficult challenge, going through one to seven Gatorades a tournament depending on blood sugar levels and lowering insulin intake. Playing college ultimate and Revolver affected his blood sugar differently. Playing as many points as he could in college, Greg got accustomed to the amount of insulin and sugar he needed. When playing for Revolver’s faceless D line, his game time significantly lessened, forcing him to discover a new system. His life can feel like a constant balancing act at times, but with the right management he can keep control. Greg Cohen making a tough grab for the Slugs under the leadership of coach Daryl Nounnan. 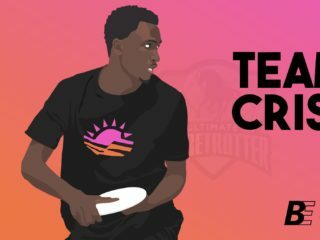 Greg learned to live and prosper with his ailment, showing the masses that you can have diabetes and still be a baller in the world of ultimate. Nevertheless, there are more than just physical repercussions of being diabetic. Most people would avoid dropping a diabetes joke to refrain from sounding inappropriate. However, you’ll often find less social taboos in the ultimate community and that many jokes are greeted with grinning faces. Everything can be funny between friends. Greg truly believes that it has been easier handling the disease because his teammates have teased him about it, even if the jokes have the potential to go too far. Greg has found the silver lining in his diabetes because of the person it has made him. Before playing ultimate, he was overweight and unhealthy. The sport really improved Greg’s blood sugar numbers and he is hopeful that ultimate can do the same for fellow diabetics. 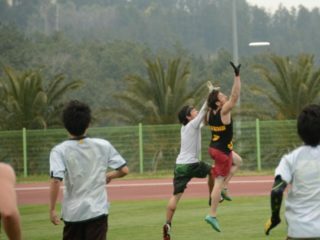 He is looking forward to his second season in the AUDL and is gearing up for another round of intense Revolver tryouts. Expect to see Greg Cohen making plays at major tournaments across the country this year. He is fit, focused and full of Gatorade. Greg’s Slug fan club cheered him on at his first San Jose Spiders game.